If you're considering a sporty, souped-up version of a practical city car, the 2018 Volkswagen Golf GTI gives you more performance and more utility than the 2018 Honda Civic Si. In fact, no vehicle is quite so versatile as the Golf GTI, as comfortable and capable on track day as grocery day. Other manufacturers make you choose between performance and practicality, but VW has brought the best of both worlds together in a nimble, comfortable, feature-rich hatchback that's hiding a beast under its hood. By comparison, the 2018 Honda Civic Si lacks the capacity, comfort and power to compete. We invite you to visit our Seattle showroom and experience the Golf GTI for yourself. Schedule a test drive and we're positive that you'll agree, the 2018 VW Golf GTI stands head-and-shoulders above the competition. Thanks to decades of German engineering heritage, Volkswagen gives their 2018 Golf GTI a sense of quality, refinement and gee-they-sure-did-think-of-everything polish that you just don't get in the 2018 Honda Civic Si. While the Civic Si employs a traditional sedan or coupe shape, the GTI's hatchback design gives you more room for cargo in the back and more headroom for passengers in the cabin. Standard interior features like ambient lighting and Volkswagen Car-Net&reg: App-Connect will have you feeling right at home. Meanwhile, on the outside, the 2018 VW Golf GTI is built to turn heads, with standard LED taillights, LED fog lights and red brake calipers. An automatic, rain-sensing wiper blade also comes standard on the Golf GTI, and isn't available at all on the 2018 Honda Civic Si. The 2018 Honda Civic Si is built with speed in mind, but the 2018 Volkswagen Golf GTI is faster by any measure than the 2018 Honda Civic SI. It's faster to 60 mph, faster from 50-70 mph, runs a faster 1/4 mile and can even stop faster and corner harder. It's all thanks to brilliant, Volkswagen-exclusive technologies like the XDS+® Cross Differential System, which lightly engages the brakes on one side when necessary to improve cornering. The 2018 Volkswagen Golf GTI also comes with a sport-tuned suspension and the ability to select between five customizable driving modes. 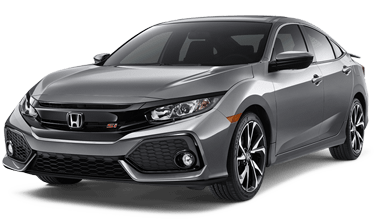 The 2018 Honda Civic Si uses the same Civic suspension and provides you with just one driving mode. Both vehicles in our comparison received a perfect 5-star overall safety rating from the National Highway Traffic Safety Administration, performing similarly in crash tests. However, the 2018 Volkswagen Golf GTI is available with more active safety features to mitigate the impact of a crash — and help you avoid one in the first place. The 2018 Honda Civic Si comes standard with a rearview camera, Brake Assist and Honda LaneWatch. The Golf GTI is available with comparable features, plus some you can't find on a Civic Si: Adaptive Cruise Control, Park Pilot, Rear Traffic Alert and Front Alert with Pedestrian Monitoring are all available on the 2018 VW Golf GTI. You can also have LED headlights with Adaptive Front-lighting System, so your GTI's headlights will subtly follow your steering to peer around bends in the dark. At Carter Volkswagen, we know the best things in life are free: Free of high-pressure sales people, free WiFi in our service department waiting area, free wiper blade installation — that's the Carter Advantage. Our promise to you is a friendly, informative sales experience that puts your needs and concerns first. We're committed to serving the people of the greater Seattle area — that's why if you test-drive or purchase a new 2018 Volkswagen from us, we're going to plant a tree in your name in the Mountains to Sound Greenway. So browse our massive inventory of brand-new Volkswagen cars, wagons and SUVs and schedule your test drive online. We're proud to serve communities from Kirkland to Renton, and we'll be thrilled to put you behind the wheel of a brand-new VW.